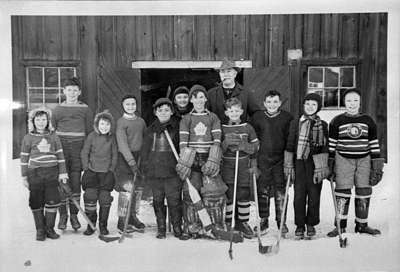 Black and white negative of a photograph of the Town Line Pee Wee hockey team. This photograph was taken in front of Taylor/Burns Arnea. The boys are wearing hockey equipment. Left to right: Herb Tran, John Tran, Paul Tran, Ruddy Runak, John Sandford, Ray Ottenbrite, Gerry Dennis, G. Norman Irwin (coach), Aime Rousseau, John Cubb, Billy Dennis, Bill Irwin. Town Line Pee Wee Hockey Team, 1948, Marjorie Ruddy. Whitby Archives 21-005-034.